Did you know that the Latin name for 'seahorse' is Hippocampus? It means 'horse caterpillar.' Seahorses are whimsical creatures that mesmerize and amaze. Do you know what would be just as mesmerizing and amazing as finding a seahorse in its natural habitat? 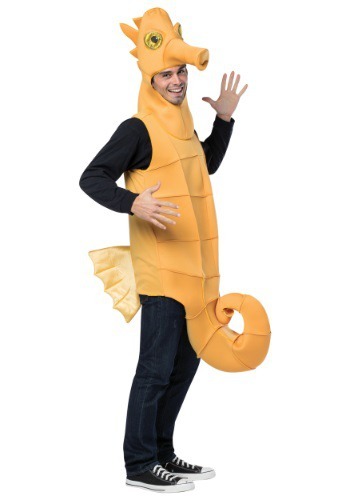 Seeing you in this Adult Seahorse Costume! You may even attract a seahorse companion in this costume, but be warned, seahorses do mate for life! Hope you're not the commitment phobe type! Whether you're a self proclaimed party animal or maybe you're just really into marine biology this costume is perfect for you! All of your under the sea dreams will not longer be just a fantasea in this unique Adult Seahorse Costume. If you've got a little one running around we've even got this costume in a child's size so you two can be a dynamic seahorse duo! This costume is made as a pullover jumpsuit so you can throw it on over any outfit and out you go! Easy, right? Don't worry, you will be able to move around the dance floor with ease, I mean if busting a move is your thing. It even comes with an attached fin on the jumpsuit and a seahorse headpiece, yeah that's right, we're not shellfish with it comes to giving you the ultimate under the sea experience! You're sure to be the life of the party when rocking this costume!